I used to tear up Caprese salads, any time I was at an Italian restaurant. I would kick off my carb-laden meal with a tower of thick, creamy buffalo mozzarella slices and tomatoes. Because the Caprese salad was listed under the “salad” section of the menu, I though I was being super healthy to precede my fat-filled fettuccini alfredo dish (which by the way is not on a single menu in Italy!) with a”salad” and being cheese’s biggest fan, this was a “win-win’ for me! Thankfully, I now know we have a bit of a “portion problem” in America, and no one needs to eat a 1/2 pound of mozzarella in a single sitting, even if it’s flanked with tomatoes and basil leaves….especially if that’s not to be the main course! 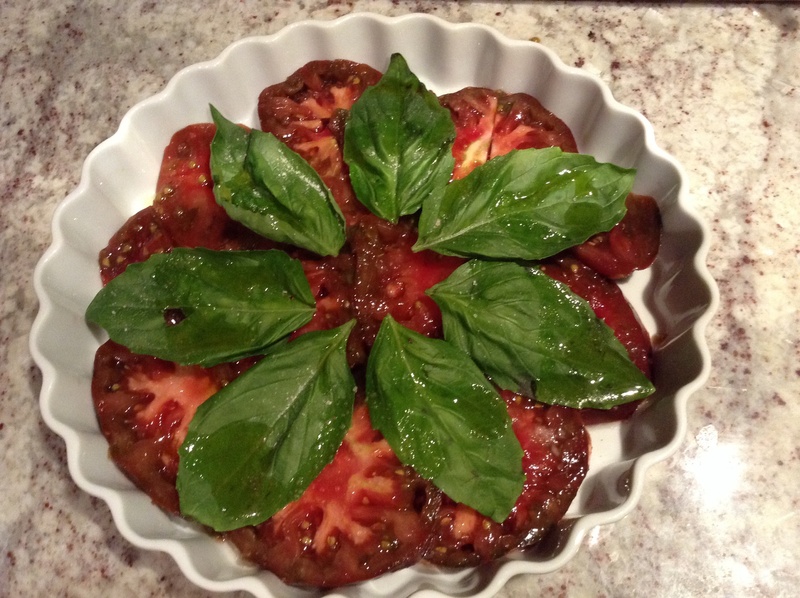 So skip the mozzarella, and soak up the high quality olive oil and basalmic vinegar with fresh basil and tomatoes. It is truly delicious sans fromaggio! This dish is so beautiful, you should strut it around your block parties and BarBQs! Interestingly enough, one summer, I did take this to a pitch-in picnic. It went over great! Highly recommend it as it is super easy to put together! I was a bit nervous to take it and was happy that people indeed liked it! I mean, we like it, but I didn’t know about others! I think there’s nothing tastier than a homegrown summer tomato, and fortunately I think many others agree regardless of dietary habits! It’s almost like they are still an American tradition! Glad yours was a success! !